As the old saying goes any journey starts with the first step!! Well in this case the first turn of a wheel, a Massey 860 combine wheel to be precise>The following story demonstrates what can be achieved when everything looks completely hopeless, out of nowhere someone who believes he can make a difference decides it's time to make a stand!! this story is about one such man and his determination to bring to attention the plight of the most underrated and hard working professional's that the rest of the world takes for granted!! 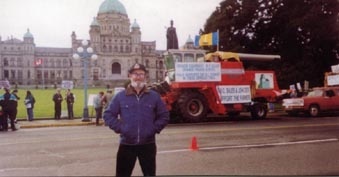 >During the late eighties ;Gloucestershire UK farmer and contractor Nick Parsons decided to join the steady trickle of farmers who had been disillusioned with Farming in the uk and moved with his young family to British Columbia Canada and purchased a 1250 acre arable farm this decision was a big one to take, Nick and his brother Tom were involved with running a farm, a contracting business, and also a John Deere dealership! 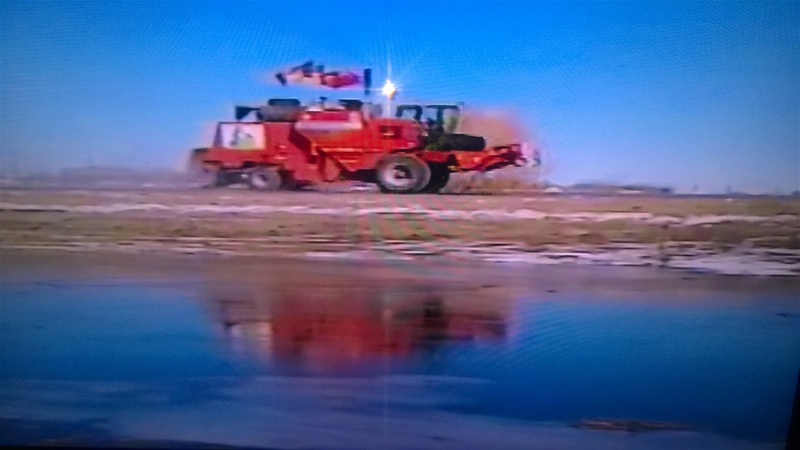 Quite a lot of work to contend with but the growing recession in the farm machinery business at that time and the tough squeeze on farming incomes ;and the mounting bureaucracy facing those who try to make it all work Nicks decision was made and a new life in Canada beckoned. Nick and Jane and their daughters aged 4 and 5 soon settled into this vast country and the harsh winters, although Nick used John Deere equipment tractors, he was a firm believer in Massey Combines in his words they were built for the harsh conditions of that country and the USA and they were also well supported at that time.>Nick would come to rely on his combines rugged reliability in a way even he would not of imagined in the coming years!. Here in the UK we don't get the ideal harvesting seasons we would like but Nick soon became aware of the harshness of crop growing in Canada after a few short seasons, early Autumn snowfall could wipe out your crop or leave it flat on the land as could severe summer storms, it really was a big gamble in this part of the world and one that any farmer would have to make every season. Nick and his fellow farmers over the years tried to get some type of dialogue with the local government regarding help for those who through no fault of their own fell upon hardship because of failed crops and the lack of any subsidies or guarantees for the crops produced for the worldwide market, a problem still today! Although the European farmers enjoy financial help in the way of subsidies and incentives not to produce certain crops! In short the Canadian farmers wanted a more level playing field!! and sensible pricing structure to compete with the rest of the World. 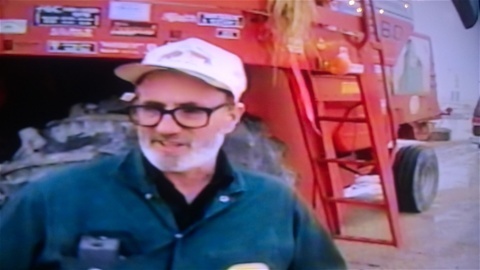 After 7/8 seasons in Canada, Nick experienced a total crop wipe out on his acreage during 1997,any salvage was very small and unfortunately his fellow farmers in that part of the country suffered the same fate! Little did anyone know at that time but a year later this crop wipe out would be repeated pushing many farmers out of business and bankruptcy. 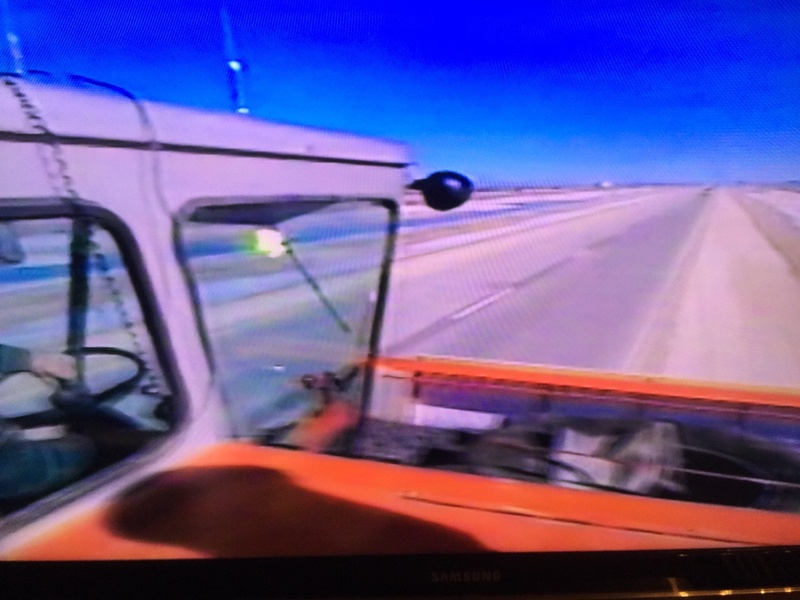 With nothing to lose Nick decided to drive his 860 combine as a protest into Victoria a trip of some 500 miles!! 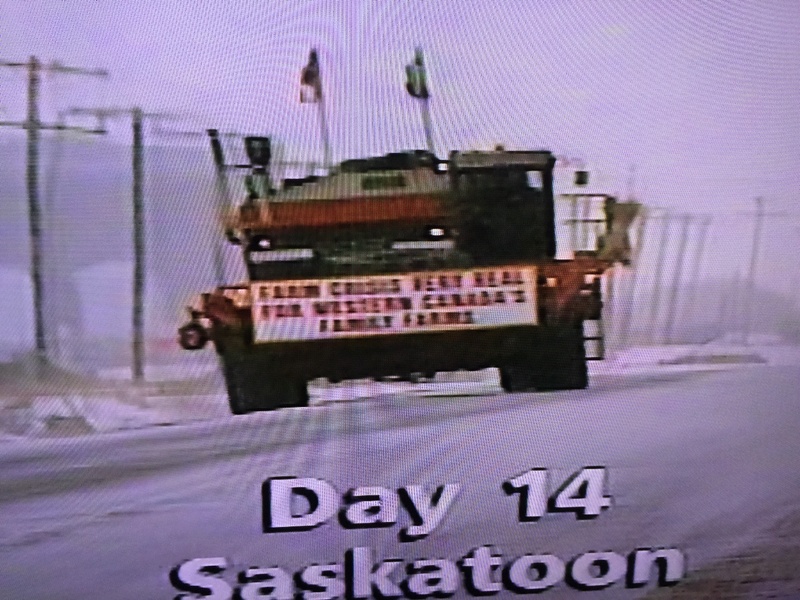 to highlight the plight of the many facing financial ruin, this trip would lead to a pre cursor for a marathon trip right across Canada as the farming situation continued to worsen. Nicks first protest trip made the headlines and he had a lot of support from farmers throughout his trip but he knew with the financial dilemmas facing everyone in this industry and the poor returns and unprecedented further crop failures it would take a bigger effort to bring these problems to the forefront of the government and media. As Nick explains during the late nineties things were particularly bad and nbsp;on one occasion he was at a meeting with fellow growers and he saw the anquish and worry etched into everyone's faces and the complete despair, this upset Nick as these were good honest hard working people who had not many years previously welcomed him and his family to this great Country. On Nicks return home that night he thought long and hard about the situation and the following day he announced to his family I'm going to drive the combine 3000 miles across Canada and I won't stop until I get a face to face meeting with the prime minister to explain the dire state of this industry!. This marathon trip was a very noble idea but the logistics and costs of driving this huge machine this distance could not be underestimated. As Nick explained at that time I had $15 dollars in my pocket and that was pretty much it! I had nothing to lose,the cost of the trip I put to the back of my mind and concentrated on preparing the combine named (prairie belle). My neighbours at the time did all they could to help me with the preparations, I had to strip of the grain tank cross auger remove the tank covers and ply line the tanks out to create a huge toolbox where I could keep tools, cutting and welding equipment, spares, etc a very rudimentary workshop! 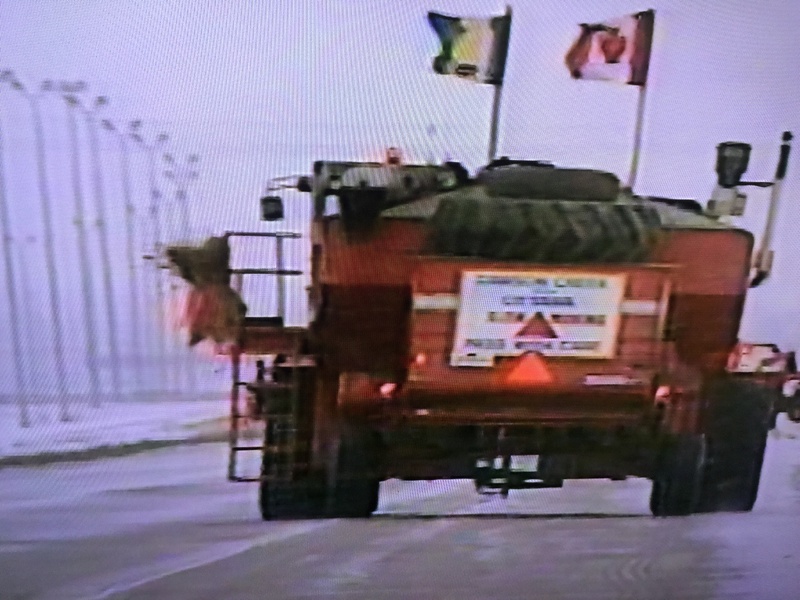 !, i would also carry a spare set of wheels and a pick up header that would carry signage that would explain the reason for his road trip, in fact Prairie belle was a giant sign board with support of various farming groups. Nick explained that he would have by choice done this trip at a better time of the season and not at the start of the winter! But as he was still a farmer this wasn't possible as the harvest for what it was worth had to be carried out. 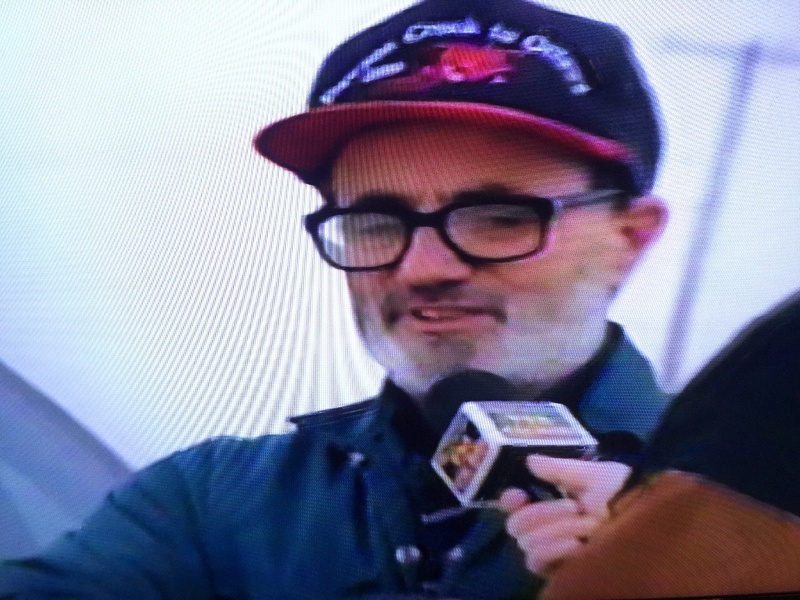 Mid January 2000 and with temperatues at 20 below, Nick bid an emotional farewell to his family and neighbours on a very cold and snowy day from Dawson creek not knowing how far or for how long this journey would last, but he had a steely determination to Finish what he started out to do, and knowing his faith in the legendary reliability of this Brantford built combine it seemed nothing would stop him now!. Nick starts out on his mammoth 3000 mile journey!! And so the epic journey begins!! All ready for a trip no one has ever attempted in a combine harvester!! 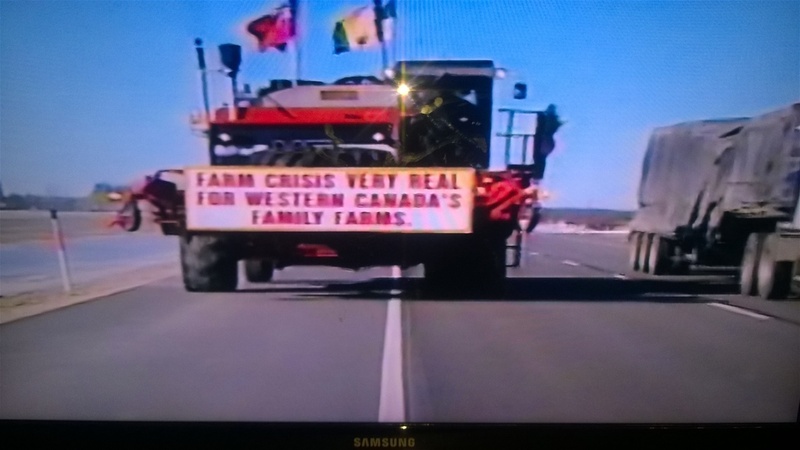 As Nick left Dawson Creek word soon spread about this epic journey and his determination to speak to the premier Jean Chretien, Nick had the support of The Ontario Federation of Agriculture who had many members! And who considered him an icon who had done much to support this beleaguered industry!! 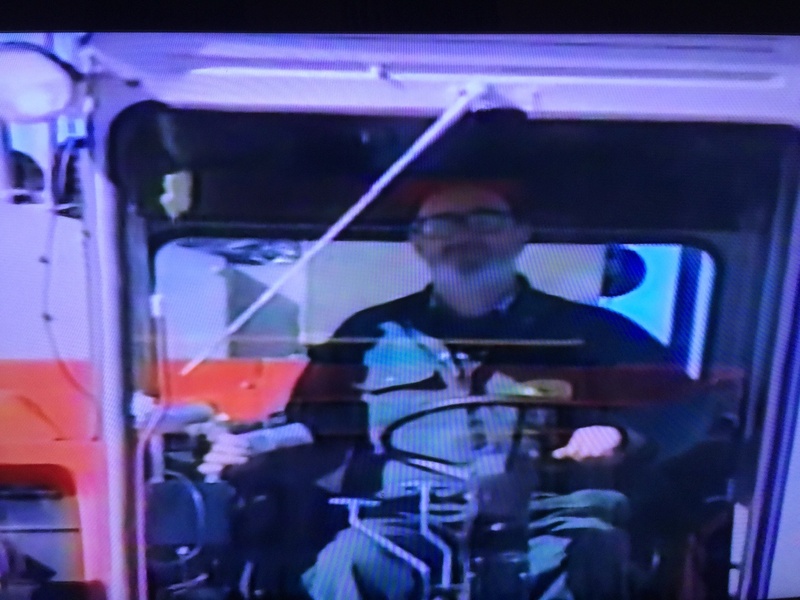 During this first week Nick would pull up in local towns for overnight stays and he was greeted by scores of people who would fill up the combine, personally thank him and offer money to allow him to stay in comfortable accommodation after his gruelling hours behind the combine wheel. Nick would catch up with Jane his wife and family at night on his mobile phone, Jane who by now had found herself as the hub for all enquiries about Nicks progress, and she would spend a lot of her day talking to tv and radio networks about the finer details of what this trip was all about! The next leg of Nicks trip would be Saskatoon another long 7 days at the wheel, the night time temperatures would reach -30 Nicks combine had special additive added to all the oils and Gas oil,so far Prairie Belle had run trouble free, and over the next few days Nick was aware of the bigger crowds of well wishers who would line the streets through towns just ordinary people who wished him well and showed their support with flags and banners, Nick commented that he was very humbled by the support of so many who had stood out in the cold waiting for him to come through! He said it really spurned him on, when I stopped for fuel or at night I was inundated with help or offers of accommodation everywhere! -A lot of these people didn't have money to spare but they offered me everything they had, one particular incident Nick well remembers was a young boy of about 9/10 years of age came forward and put $5 dollars in my hand and said to me I have been saving up my pocket money for you Mr Parsons! Do you think you really can save my Mom and Pas farm for them!! This really was what I was doing this for this is what mattered nothing else. I think of that young man a lot and the many who were in that perilous position of loosing everything. Nick and Belle encountering one of the many bridges on his first protest trip, to Victoria. fortunately they were all standard size! But only inches to spare!!! Belle looms out of the mist! a beacon of hope! Day 18 and Regina, the weather had improved some what blue skies still bitterley cold,but this didn't last long ! 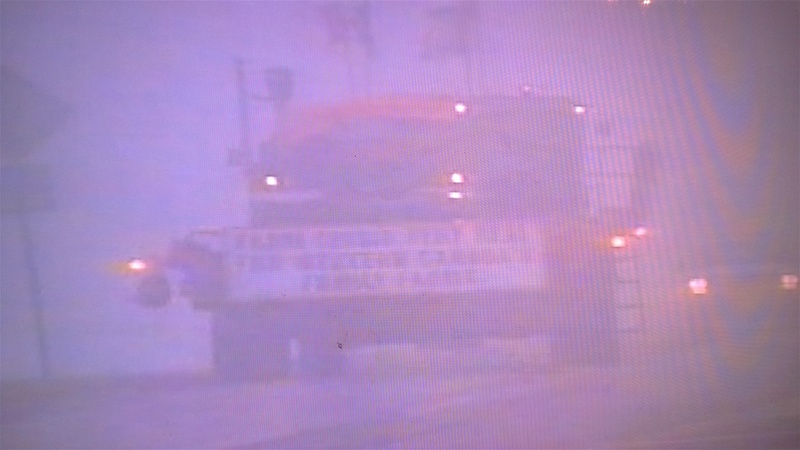 !As intense fog would now slow things up !! but as Nick said every day i have a panoramic view of this beautifull country, one interviewer said what do you do to break the boredom of the slow travelling speed!! Nick commented how can you possibly get bored looking out of this cab everyday? its the best show in town everyday! Within 10 days Nick had travelled through Brandon, Nepawa, Gladstone,and Portage la prairie MB, arriving at Winepeg on the 10 th day, by now the progress everyday had shorten somewhat because of the constant interviews and news teams who were now part of the convoy beaming back Nicks progress back state to state and on all the radio networks. Nick said i found the daily ritual of interviews and constantly pulling over for the news teams very tiring but it was most important to get the message across to all who would listen! and remember i was asking to meet the Prime Minister and the more pressure from the media would i hope add to this becoming a real possibility. Day 29 and a broken traction belt! this 1980 model 860 was belt driven and not hydrostatic driven, Nick had spare belts as he knew this item for sure would take a lot of punishment! 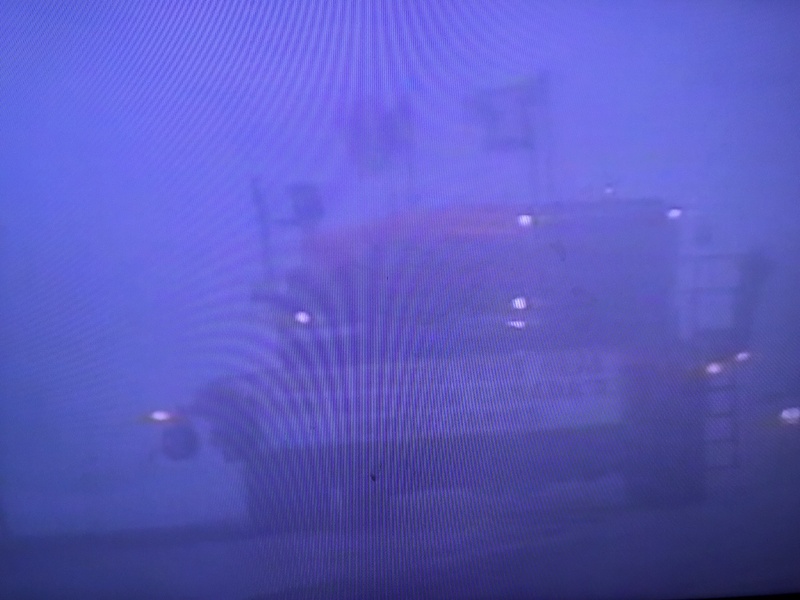 in a few short hours Nick was back on the road although there was trouble heading his way some adverse fog with zero visibility that would put his trip on hold courtesy of the local highway patrol!! Out of the mid winter gloom and zero visibility comes a bright shining beacon of hope!! In the shape of Prairie Belle!! 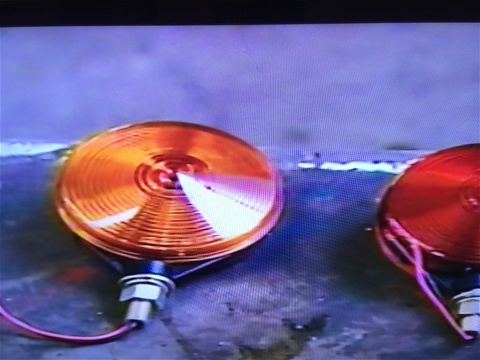 The new rear flashing beacons donated to keep Belle on the road!! Nick had travelled all day in very bad fog with zero visibility, this type of intense fog at this time of year was very unusual in this area and the forecast was not good with no end in sight!! As Belle reached the outer city limits of Winnipeg Nick was escorted off the highway by a local cruiser with two officers, they were very concerned not only for my safety but other motorists as the rear lights on Belle were never ever designed for these conditions and I lfully understood their point of view. I had a choice here, stay in town untill the weather conditions improved , which could of been days !or try and secure some better lights! Well just one phone call and within 45 minutes a very kind gentleman turned up with all that was needed to rewire the new lights! Within a couple of hours Nick and Belle were back on the road! In a Matter of a couple of days the weather improved, visibility was better but temperatures were well below freezing during the day but this didn't deter the local communities who came out to show their support as was experienced from day one, Nick takes up the story, At this stage of the trip I had become well use to talking on camera and radio interviews! At first it didn't come easy ,after all I was a grain farmer and not a politician! But i would start off an interview with the line ladies and gentlemen! I trust you all have had breakfast/lunch "depending on time of day" well you wouldn't of done if it wasn't for the farmers!! It's something you all take for granted but you shouldn't for sure! . This would normally grab their attention!! and off we would go trying to explain what we were trying to achieve, and that was simply to save an industry from economic catastrophe. During my decade of farming in this country I had become well use to the extreme winter temperatures and snowfall,several seasons would see my crops under many feet of snow you just wondered if you would have any crop come spring! It certainly wasn't a business for people who weren't risk takers for sure. As you can imagine snowfall was always a contant threat, but on this trip at least the quantity never stopped old Belle!! 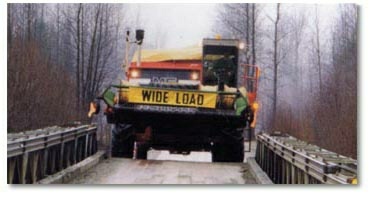 But for sure there were many times when I would be rolling down the highway alone with the snow blowing and a total whiteout, to many people it must of seemed very surreal to see a combine harvester in these conditions, as I travelled along, the reassuring purr of the British built Perkins A6 engine was a comfort and reassurance that old Belle would keep me safe and take me too wherever this journey would end!! A deserted snow swept highway, against all odds the journey continues!! On her way!! Spare wheels onboard!! Another day another interview!! All in a day's work now for Nick! Nick at ease aboard Prairie Belle!! On board with Nick!! Another endless arrow straight highway!! More photos of this epic trip plus!! Arrival at Winnepeg! !It's just not enough!! The end is in sight!! Silence from the Premier of that all important meeting!! !